With our VR Heart Flythrough, we are presenting another example of imagining new ways of presenting and exploring human anatomy. This time, by combining Virtual Reality (VR) with game design and inspirational ideas from the movie “Fantastic Voyage”. Areesha Salman, a Bioinformatics student in the Bachelor of Health Sciences program, has created a virtual fly-through and exploratory adventure inside the human heart. Developed with Unreal Engine, a computer game design environment, Areesha has built a 3D world, where you see the heart from the perspective of a red blood cell as it makes its journey through this fantastic organ that keeps us alive. In addition to the fly-through, there are stopping points as viewing platforms, from which you can inspect more details about the anatomical structures of the heart. You can also watch instructional movies that explain heart physiology and highlight other interesting facts about the human heart. 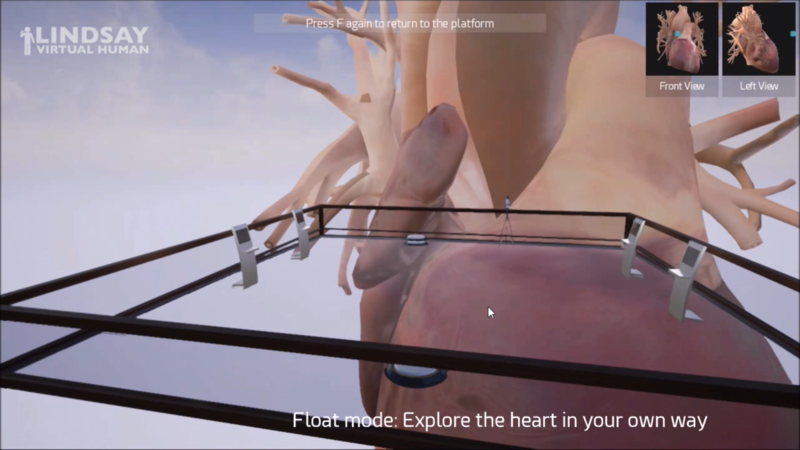 You can see the VR Heart Flythrough in action at our LINDSAY Virtual Human video channel.